If you read my blog often, you know that I read and review a lot of books. Some are funny, some are romantic, some are nonfiction, and there are a variety of other genres I read through. 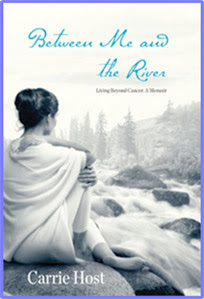 Of all the books I've read this year, none has moved me to the core the way Between Me and the River did. This is the best book I have read in a very long time. In the Fall of 2003. Carrie Host was your average mother of three, who started experiencing some disturbing medical problems. She was in excruciating pain and no one seemed to know quite way. She was eventually diagnosed with Crohn's Disease, a diagnosis she just did not believe. So, she sought more doctors and more tests. The results were that she had carcinoid cancer. This devastating news is where the book begins. Carrie takes you along with her and her family as they deal with tests, surgeries, treatments, and all the medical side of cancer. You are also there for the emotional part; Carrie telling her kids, her fears, her relationship with her husband. It is one of those books that you almost feel like you shouldn't be reading, somewhat like reading a diary. Carrie Host simply bares her soul for you within the pages. I sat there and went through a multitude of emotions with her; from rejoicing, to crying, to laughing, and every other feeling you can think of. I ached and sobbed as she told about missing her baby's first birthday. And I stood in awe of her bravely facing such a grave disease with wit, wisdom, and an amazing will to survive. I urge you to read this book. All I can really say is that is a powerful memoir of a remarkable woman. You really do not want to miss it. Thanks to Lisa Roe for the opportunity to read this amazing memoir. I love books that you feel like you shouldn't be reading.